Big Girls Love Crochet Too!! | That's Knotty! Wow. it has been a LONG time since I posted on here. It seems life just sort of got in the way! But today I’m back, with an all new pattern to share! Unfortunately, my son lost the memory card to my camera, so I’m stuck with a VERY BAD QUALITY camera phone picture. These look so much better in person! Yarn Used – I used Red Heart Super Saver in the color Jade, but any similar weight yarn will work! Round 3-8 – Repeat round 2. Round 9 – CH 1. 1 SC in same ST as join. 1 SC in each ST around. Round 10 – CH 1. Skip joining ST and next ST. [2 DC, 1 TR, 2 DC] all in next ST. Skip next ST. SL ST in next ST. *SL ST in next ST. Skip next ST. [2 DC, 1 TR, 2 DC] all in next ST. Skip next ST. SL ST in next ST* Repeat between * and * seven more times, for a total of 9 points. Fasten off. Weave in tails, using bottom tail to close gap left by joining Round 1. Add a bow or embellishment of your choice, or leave them plain! And that’s all there is to the Wide Calf Boot Cuff! To make them smaller or larger, just adjust your starting FDC to the necessary length, making sure you have multiples of 5. 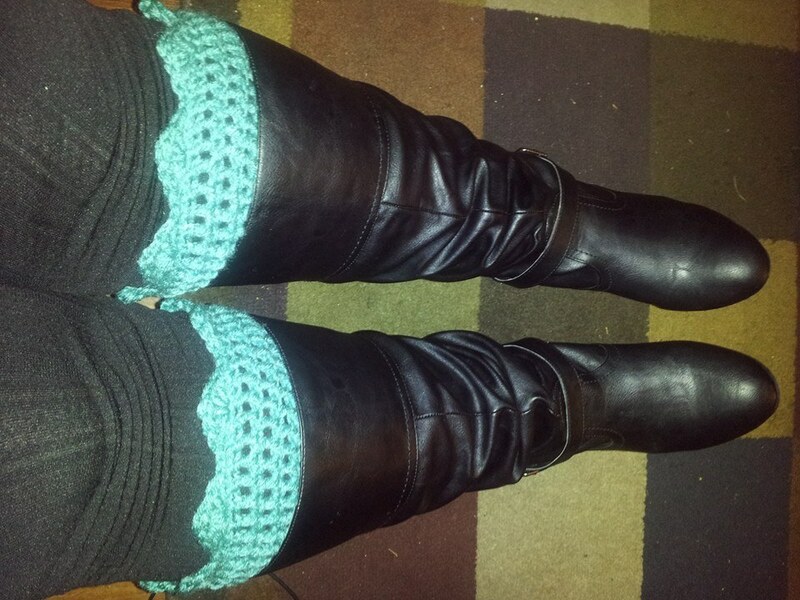 I hope you enjoy these boot cuffs! I’ll try to find my memory card and get some better pictures posted!